The Celestron 52330 offers an amazing viewing experience in a rugged and durable rubber armored housing that is fully waterproof and Nitrogen filled. The optical system with proprietary XLT multi-coatings renders high resolution images with outstanding contrast while the dual focus mechanism allows you to get subjects in focus quickly and then fine tune the image. Large objective 80mm and 100mm models are extremely useful in the field . Whether bird watching, hiking, camping, or just observing the scenery, the TrailSeeker Spotting Scope series in outdoor ready! Theese scopes’ robust, fully armored design protects them when out in the field and provides additional peace of mind that they’ll be ready when you need them. Fully multi-coated optics increase light transmission through the optical path to deliver crisp, high contrast images. Focus on a subject quickly, then fine tune the image using the dual focus mechanism with course and fine adjustments. The rotating tripod mount rotates a full 360° and allows the eyepiece to be set in any viewing position. Zoom up to 48x magnification or see the widest field of view at 16x. 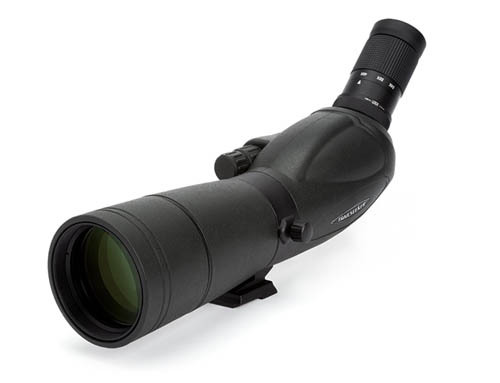 Perfect for those who want performance in an easy-to-carry package, the 65mm objective design lets in plenty of light while keeping the overall size of the scope to a minimum. The Celestron TrailSeeker 65-45 ° has many exciting features for users of all types. You can extend the lifetime of your Celestron TrailSeeker 65-45 ° with the purchase of a FactoryOutletStore Factory Protection Plan. See the Celestron TrailSeeker 65-45 ° gallery images above for more product views. The Celestron TrailSeeker 65-45 ° is sold as a Brand New Unopened Item.